Port Mor, Muck, by the back door. Ian and I were now paddling NE and were sheltered from the swell. We passed the restored fisherman's bothy at Port an t-Seilich. The east of Muck is so low lying that the skyline is dominated by the distant Sgurr of Eigg. The mouth of Port Mor is partially obstructed by a large reef system called the Dubh Sgeir. The channels on either side are called Dorus Beg and Dorus Mor: the Little Door and the Big Door. Despite the low tide we managed to get through the gap this time (unlike the gap on the map at the north end of Muck). ...Cuillin ridge of Rum makes a wonderful backdrop. We paddled past MV Wave which was the Muck flit boat for many years until the new slipway and pier were built in 2004. A flit boat ferries passengers and goods too and from a ferry that is unable to approach land. 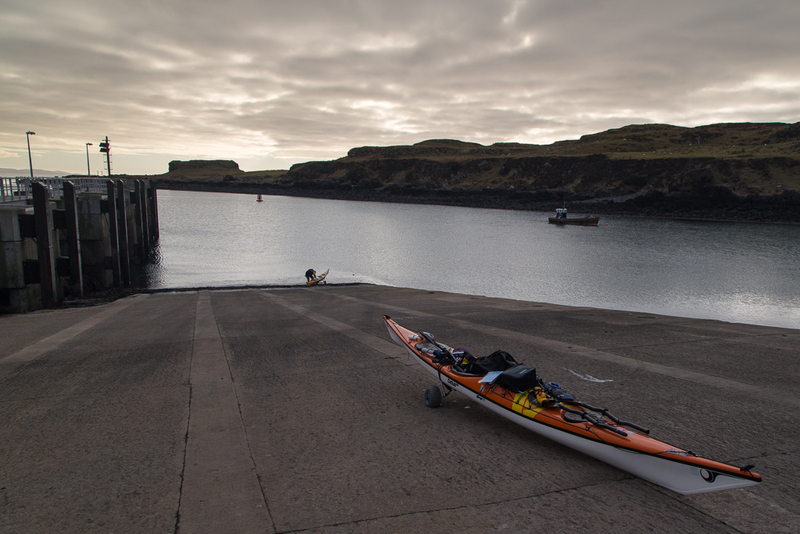 The MV Lo0ch Nevis (the Small Isles ferry) was not in port so we landed on the slipway and pulled our kayaks out of the water for the last time on this trip. 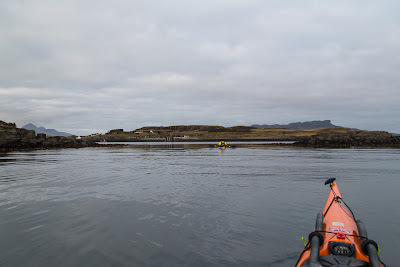 That morning on Eigg (it seemed a week ago at least!) we had arranged to stay the night in the Muck bunkhouse. 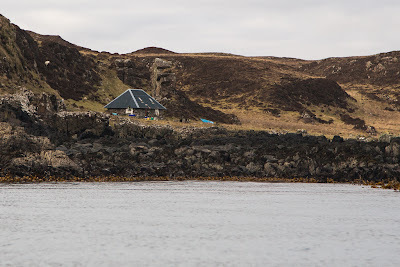 The pierhead is one of the few places on the Small Isles with a mobile phone signal, so we were able to phone Rosie, who runs the bunkhouse, to warn her of our arrival.